Curious about how brushes are made? 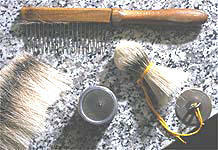 This section will give you information about the craftsmanship that goes into the various kinds of bristle brushes. Q: What does "handmade" mean? Handmade means that the bundles are created by hand. The person takes a certain amount of hair in his hands and forms the typical round shape of the bundle. 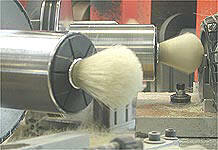 The reason is that fine badger hair is easily destroyed when made by a machine and also by trimming the fine badger hair tips (which are split) the most important part would get cut off. This would not allow the creation of a good lather as the split tip holds water and foam in the brush. Material is weighted depending on the size of the ring/knot. The tuffs are carefully combed to remove wrong aligned hair. The characteristic shape is achieved by striking on the top of the hair with the shaping box. The tuft has now been carefully bound together with a tread and removed from the shaping device. The excess hair is cut away. After the glue is hardened the brush can be combined with the appropriate handle made from different materials. Information and photos in this section are with the courtesy and permission of Hans Juergen Mueller KG.